You are not anonymous on the Internet. Even if you practice safe surfing by keeping your name, credit card number, and other private data off the Web, your Internet service provider may not be so scrupulous. Many telecom companies and search engines log user activities, and smart snoopers can mine these logs for your IP address and browsing history to figure out where you live, what you like and who you've been talking to. To maintain privacy while surfing the Web, you need to encrypt the data you exchange with websites and mask where that data is coming from. Enter the Tor Network, a free service maintained by the nonprofit Tor Project and a worldwide network of volunteers dedicated to keeping the Internet free and private. The Tor Network is an incredibly complicated network of servers designed to anonymize your activities on the Internet. Remember, every time you load a web page your browser sends out a request for the data on that page and returns it to your home computer. When you use Tor, that request enters the Tor Network via an entry point known as a relay. Most relays are servers running a copy of the Tor software, which encrypts the request and sends it through a random series of server relays (at least two) to confuse surveillance and frustrate anyone monitoring your Internet activity. Every time your request passes through a node it will remove a layer of the encryption, until at last your request hits an exit relay and proceeds out into the Internet again to request data from the web page you're trying to visit. Even if the server hosting the web page you're trying to access logs your search queries or IP, there will be no way for anyone to associate that data with your name. Backtracking the request to your location is also much more difficult, because after the server returns the relevant data it bounces right back through the Tor network before being delivered to your home PC. Tor is completely free to access, and it's been used with great success by hackers, privacy enthusiasts, and political dissidents in Egypt and Iran to elude government surveillance. To access the Tor Network, just hop over to the Tor Network website and download the Tor browser bundle to get an older copy of Firefox with the Torbutton extension, which allows you to enable or disable browsing through the Tor Network with the click of a button. While we'd normally encourage you to upgrade to the latest version of Firefox, stick with the older version if you like the convenience of the Torbutton extension. Unfortunately, browsing the Web anonymously through Tor is still awfully slow. The problem is that every time you access a new page you have to jump through a randomly generated number of nodes in the Tor Network, and there are less than 1,000 nodes being shared amongst all Tor users. There's not much you can do to improve the speed with which your requests are routed through the Tor network, but you can lighten the congestion by running your own Tor relay. There are three kinds of Tor relays: exit relays, middle relays and relay bridges. Middle relays are servers which are openly part of the Tor network. All incoming and outgoing traffic that passes through these relays is encrypted and anonymous, so they're quite safe to run on your home or office PC. Relay bridges are just standard middle relays that don't advertise as such, which makes them more difficult to shut down. They're actually pretty safe to run on your home computer, but you run the risk of being placed under surveillance by governments and other watchdog organizations working to sniff out Tor relays. Exit relays are the last stop when your browsing request leaves the Tor network, and it's their IP address that's revealed if anyone tries to monitor your Internet activity. That means that running an exit relay on your personal computer is risky, since anyone could use the Tor network for unscrupulous purposes and it would look like they were doing so from your home computer. For the purposes of this article we'll be focusing on setting up a middle relay, since the other two are potentially dangerous to operate. 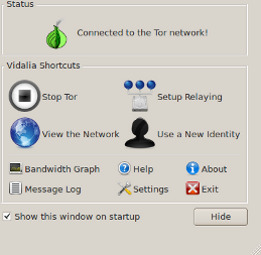 To get started, download the stable Vidalia software bundle from the Tor Project website and install it. Open the control panel and select "Set Up Relaying" to create a middle relay. Select the "Relay traffic for the Tor network" option to start your own middle relay, then give your relay a nickname for easy identification, enable automatic port forwarding and disable access to all Internet resources in the "Exit Policies" menu to ensure your PC will only be used as a middle relay and not an exit relay. Finally, just hit the "Start Tor" button to get your relay going and join thousands of volunteers across the globe working to keep the Internet private.